Excellent sensitivity to low levels of alpha, beta, gamma and x-ray radiation. 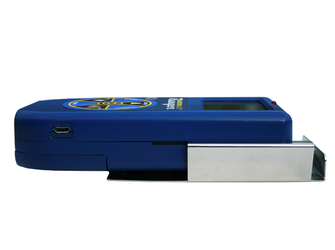 The Ranger is a microprocessor controlled radiation measuring instrument which offers excellent sensitivity to low levels of alpha, beta, gamma and x-rays. 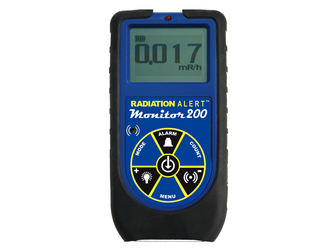 The digital readout is displayed with a red count light and audible beep, providing instant indications of the radiation level. Additional benefits include an adjustable timer and external calibration controls. Now with USB and the included Observer USB Software, you can download your data from the internal memory, set computer alarms and calibrate your instrument. Maintain full function of the 078-513 Inspector Survey Meter while shielding it laterally to reduce the influence of background radiation. Constructed of steel with 0.5" thick lead lining built into left and right sides, the holder conveniently supports the Ranger while allowing full operation of the optional sliding wipe test plate -- without having to lift the meter. 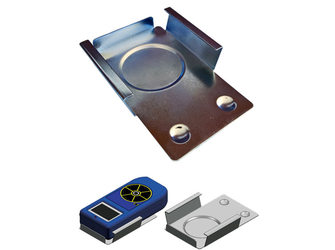 This accessory is especially suited for use in mobile units, or locations where the meter is frequently used for standardized procedures in a single location. The unit is supplied with strips of reclosable fastening material for affixing to countertops or other surfaces. Detector: Halogen-quenched uncompensated GM tube with thin mica window, 1.4-2.0 mg/cm2 areal density. Averaging Periods: Display will update every three seconds. At low background levels, the update is the moving average for the past 30-second time period. Time period for moving average decreases as radiation level increases. Energy Sensitivity: Detects Alpha down to 2 MeV. Detects Beta down to 0.16 MeV; typical detection efficiency at 1 MeV is approx. 25%. Detects Gamma down to 10 KeV through the end window. Accuracy (Referenced to Cs-137): Typically ± 15% from factory. Menu: Options accessed by holding down menu button. Pressing the menu button toggles you through functions. Select “+” or “–” to change setting. Power Requirements: Two AA alkaline batteries, included.